Recently a(nother) paper appeared of Salvador & Cavallari about a new Leiostracus species. 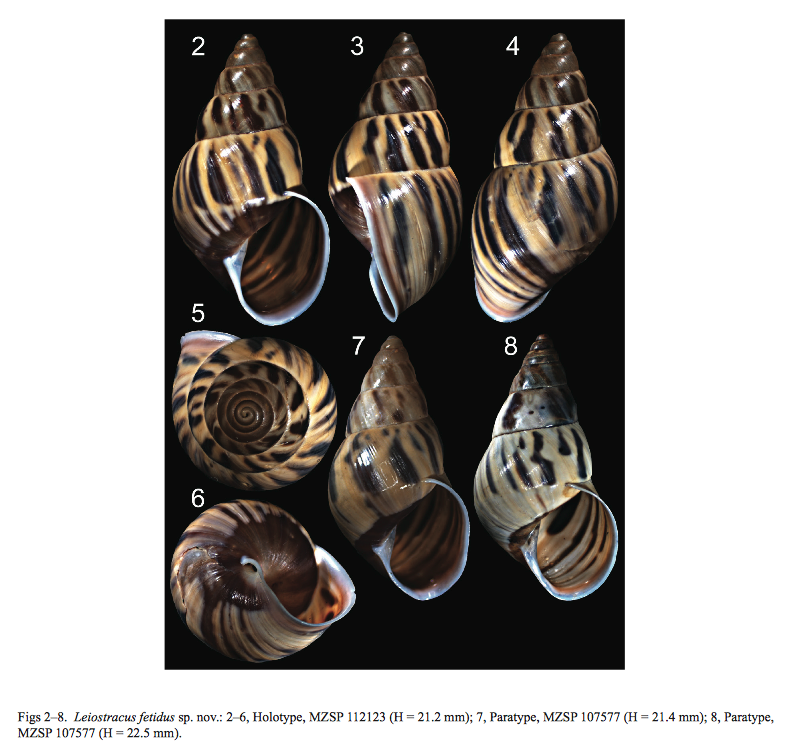 “A remarkable new species of pulmonate snail was recently collected in a small Atlantic Rainforest fragment near the city of Canavieiras, state of Bahia, Brazil, an area known for a high diversity of land snails. It is described herein as Leiostracus fetidus sp. nov. and can be easily identified by its color pattern of irregular brown to black axial stripes on a white to yellow background, a reddish axial band “separating” the white peristome from the rest of the shell and a broad brown spiral band surrounding the umbilical region. Other diagnostic features include a relatively small size, a proto columellar fold and two very weak folds delimiting the basal region of the aperture. This discovery is a reminder of how little this fauna is known and also an alarm for proper conservation of these forest fragments”. This entry was posted in Uncategorized and tagged brazil, Leiostracus, literature, taxonomy, types on July 24, 2014 by bramb.